Spring Boot Admin – First official Release! 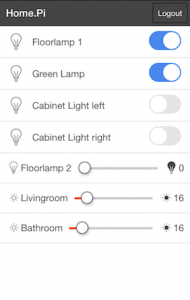 Today I want to inform you about a new release of my home automation solution “Home.Pi”. First I want to apologize to all those whom I have not yet replied to their questions after the first post. Maybe the following article answers some of them and helps you to get it running on your own hardware or cloud service. In the meantime I experimented a lot with different technologies, e.g. Ionic Framework, Firebase, MQTT, etc. and released some new versions of Home.Pi. But in the end I was not really convinced with the solutions. The Release v3.0 was running with Firebase and it worked good, but I don’t like vendor lock-in especially for private open source projects. So I decided to move most of the stuff into the trash and implemented a really small solution which is now based on the Ionic Framework for the GUI and a lightweight Message Broker (MQTT) to connect the devices. To get it running just read the following instructions or go directly to Github for further and maybe updated instructions. 3. 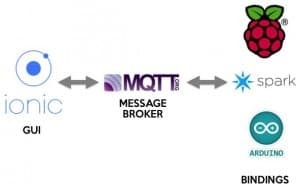 Publish the device configuration to the MQTT broker. For the first time you can leave the config as it is and simply execute the script publish-config.sh. Beforehand please make sure to modify the credentials to access your own MQTT broker inside the script. As a next step you have to setup a device controller. You can find some MQTT bindings here. For the quick start I recommend to buy a Raspberry PI, a 433MHz transmitter and some cheap switches which are supported by rc-switch. See the mqtt-exec repository to setup the MQTT binding and my old blog post to install rc-switch on the Raspberry Pi. 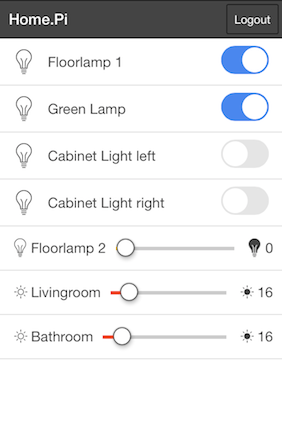 Unfortenately there are only 3 device types supported at the moment (on_off, dimmer, thermostats). But don’t worry, it’s really easy to add your own devices and get them running. First you have to extend the device configuration and publish it to the configuration topic (<username>/home/config). id: The unique identifier of the device. The id should also be part of the topic. topic: The topic to subscribe to. When you modify the value in the GUI, then a “/set” will be added to the outgoing topic name. Thats important when you build your own binding later. I looked deeply in it to test it but I can’t find the way to display to control. I have the login.html panel but the device.html panel displays nothing. I’am testing it on Linux. I saw that your have define an IOS device. I tried to modified the project for an Android device but without success. Where to look to debug it. More info regarding my problem. Actually, the black bar with Home.Pi…Logout is displayed but not the panel itself. Everything between is not showed. Sorry and thank you again for that fantastic demo.